Chaim Boruch had a great day!! Don’t you just love sunny, happy , perfect days? Today we went for a long drive to Brentwood where we found a fruit farm for us to pick our own fruits and vegetables. Oh how I love these kinds of days. Wish I could bottle them and take them out on the rainy , gloomy days! Anyways, I am just so proud. Chaim Boruch, for the first time, really particpated in a family outing! 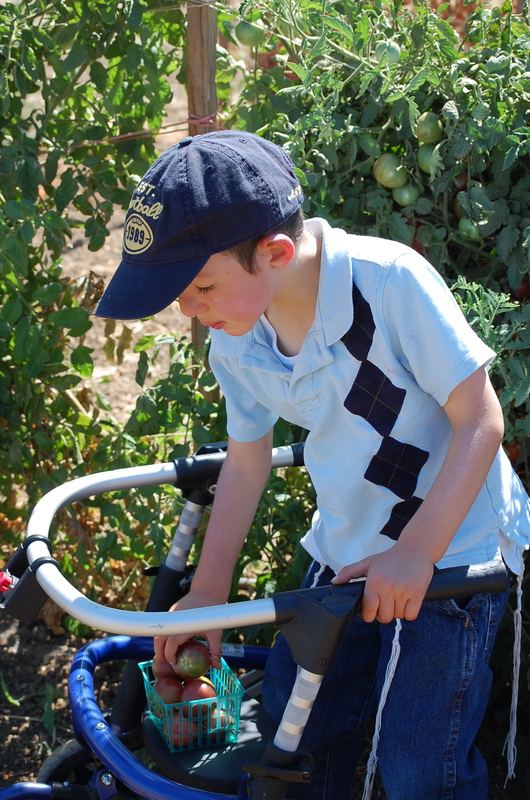 He used his walker and picked tomatoes and strawberries and filled his little basket. He was doing it all on his own, pulling the fruit off the vine…ripe or not…it was gonna come off that vine!! I just couldn’t get enough of the sight! My little son and his little basket. We all have a basket in life. What are we putting in? Are our fruits ripe and ready to be pulled from the vine? May we all fill our baskets with hard work and effort and the smile and laughter and fulfillment that Chaim Boruch has when he fills his. Good night my little farmer.